Fiddler is basically a proxy server. It is primarily used by web developers for testing and improving website performance and security. 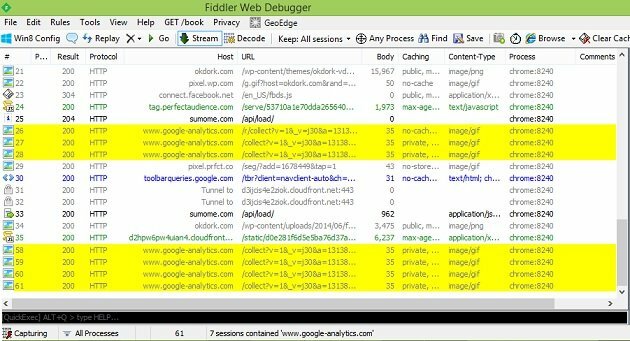 I use fiddler only for debugging Google Analytics issues and that too only when I have got a special case. Majority of the time, I use Google developer console. 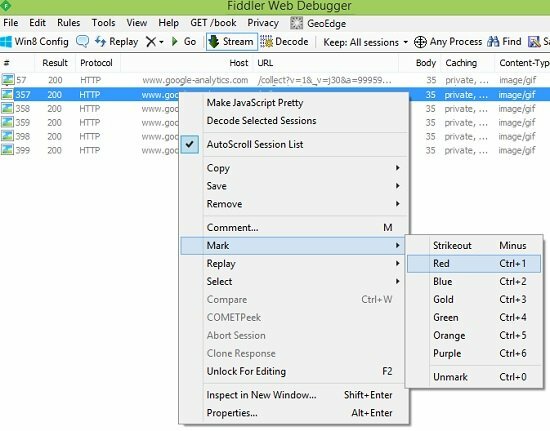 Just like Google developer console, Fiddler can also simulate production environment and thus make it possible to test code on a live website without server access. But unlike Google developer console, Fiddler can do many more things which I will explain in this article. 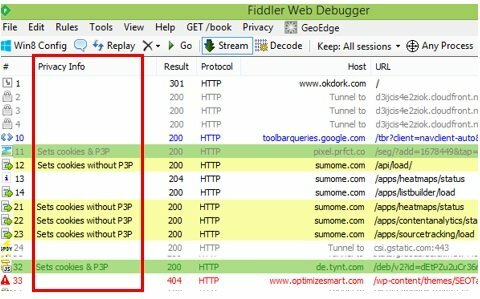 Fiddler records all HTTP requests and responses between a web browser and a web server. 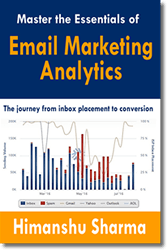 This also includes all the hits (pageview, screenview, event, transaction etc) sent by a web browser to the Google Analytics server. Fiddler is a free desktop tool and very easy to install. You can download this tool from here: https://www.telerik.com/download/fiddler. So all the screenshots included in this article are from this version. Before you use Fiddler, it is very important that you understand what a web session really is and how browsers and servers communicate with each other. The entire Fiddler tool has been developed around the concept of web session. A web browser (like Chrome) and a web server (machine which host your website) follow set of rules to communicate with each other. These set of rules are known as Hyper Text Transfer Protocol or HTTP. 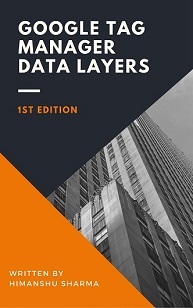 If there is a secure connection between a web browser and a web server, then the set of rules they follow to communicate with each other are known as Hyper Text Transfer Protocol Secure or HTTPS. The web server communicates back by sending HTTP response for each HTTP request. 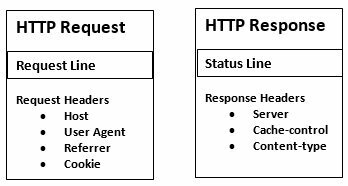 Each HTTP request is made up of request line and request headers (also called HTTP request headers). Similarly, each HTTP response is made up of status line and response headers (also called HTTP response headers). 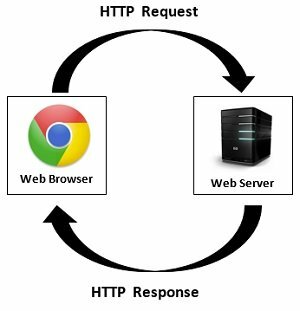 A web session is a series of interactions (HTTP requests and responses) between a web browser and a web server in a given time period. This request was made to my web server (where my website is hosted) by a user’s browser. Now since the request was made to my web server, my server has to communicate back (it has to obey HTTP protocols) to the user’s browser. It does so by sending HTTP response. This response was sent by my web server to the user’s browser. Now if you want to see these HTTP request and response headers, you just can’t see them by viewing the source code of a web page. You won’t find them there. text session – the session in which text file was requested from the web server. css session – the session in which css file was requested from the web server. image session – the session in which image file was requested from the web server. cookie session – the session that set cookies. 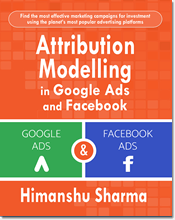 Google Analytics session – the session in which hit data (pageviews, screenview, event, transaction, item etc) was sent to the Google Analytics server. 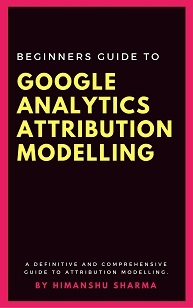 Keep in mind that what Google Analytics called as session (or visit) is different from what Fiddler called as session. 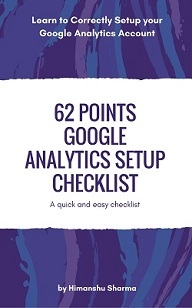 In case of Google Analytics, a session is that web session in which hit data is sent to Google Analytics server. This is not the case with fiddler. So don’t get confused with Fiddler sessions. 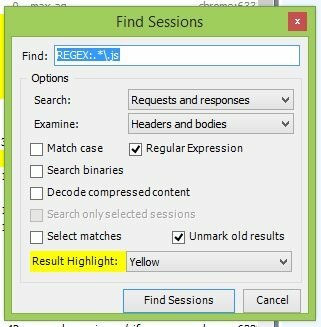 Otherwise your session list won’t appear. 2. 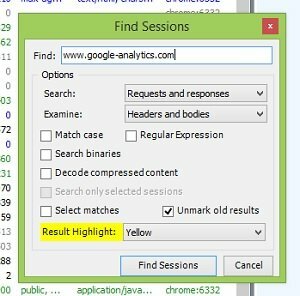 Make sure that you clear your browser cache before you view the session list so that all HTTP requests are sent and captured. 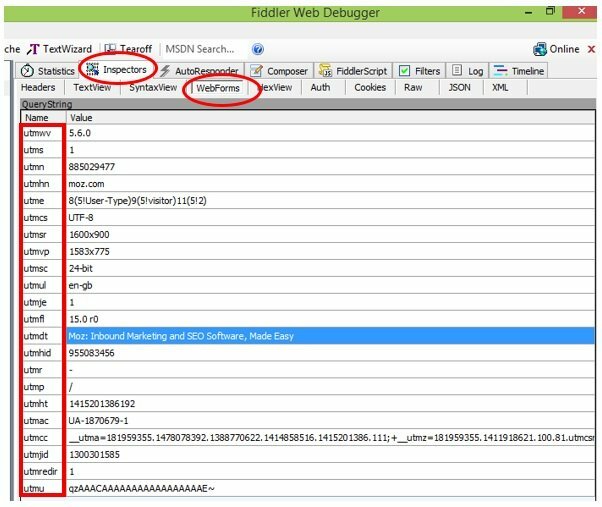 The first column of the web session summary contains the Fiddler ID number (the number used to uniquely identify a particular web session in Fiddler) like 1, 2,3,4,5 etc. The second column of the web session summary contains the status code. Common status codes are 200 and 304. 200 means HTTP request was successful. 304 means the requested resource has not been modified. So there is no need to re-transmit the resource. 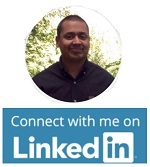 The fifth column is the URL of the requested resource. Then there are other columns like body, caching, content-type, process, comments etc. 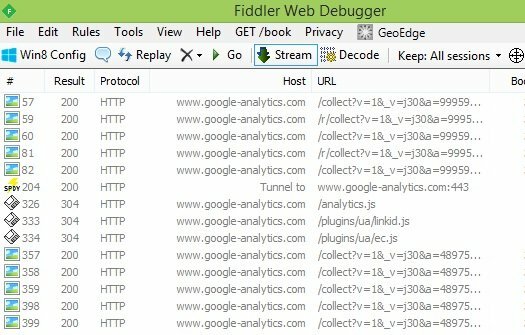 If you are using Fiddler just for the purpose of Google Analytics debugging, you may not want to see non-google analytics sessions in the fiddler list. 3. Tracking beacon for other event hit type. A tracking beacon is the query string of the GIF request. Step-1: Delete the previous session list by selecting ‘Remove All’ from the drop down menu. Step-2: Type a website address say www.moz.com in the ‘quick execute’ box and press enter. 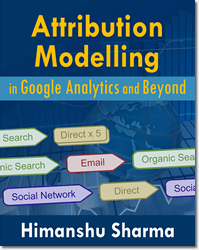 Make sure that you already have filter set up that filter out all the Google Analytics sessions. Through Inspectors tab > Web Forms, you can easily read each and every parameter of the query string (aka tracking beacon). 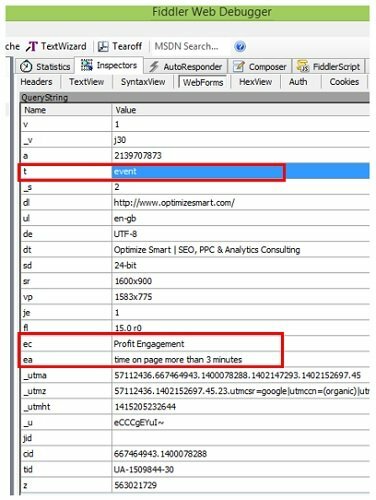 By reading this tracking beacon, you can determine the hit and browser data that is being sent to Google Analytics server. As you can see, the tracking beacon is made up of multiple parameters like: utmwv, utmn, utmhn etc and each parameter has got special meaning. utmwv denotes the tracking code version. utmn denotes the unique ID generated for each GIF request. 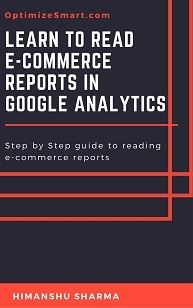 The first thing that you would notice by reading the tracking beacon is that moz.com uses the old Google Analytics library (ga.js). This is evident from the query string parameters like: utmwv, utms, utmn etc. The query string parameters are different in case of Universal Analytics. Step-2: Type a website address say www.okdork.com in the ‘quick execute’ box and press enter. 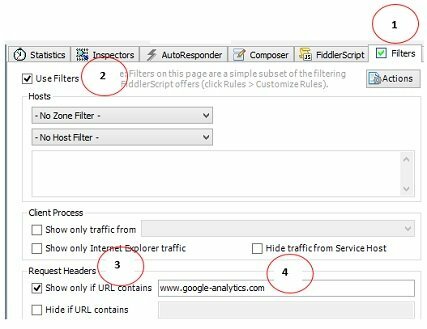 Make sure that you already have filter set up that filter out all the Google Analytics sessions. 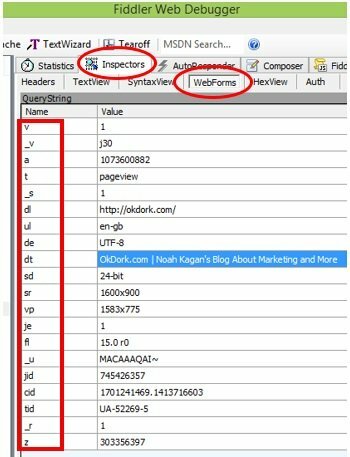 The first thing that you would notice by reading the tracking beacon is that okdork.com uses Universal Analytics library (analytics.js). 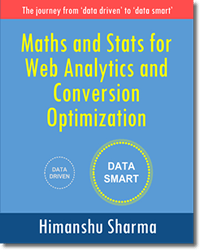 This is evident from the query string parameters like: v, _v,a,t etc which are different from the parameters sent in case of the classic Google Analytics. Each parameter has got special meaning. For example: ‘t’ denotes the hit type, ‘tid’ denotes the property id, ‘dt’ denoted the page title etc. You need to remember the meaning of each parameter in order to read the tracking beacon. The tracking beacon is sent for each hit (pageviews, screenview, event, transaction etc). Step-1: Select the HTTP request you want to drop from the session list. For example lets say you want to disable enhanced ecommerce plugin in order to determine whether this plugin is interfering with your website tracking. 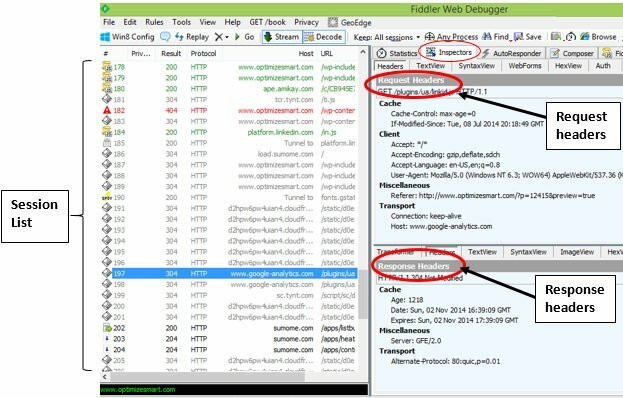 Auto responder allows fiddler to response on behalf of a web server. 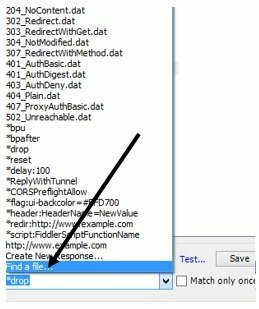 Thus you can determine whether client (browser) can correctly handle the server response. So what Fiddler will do now, that going forward, whenever it will see a HTTP request to download enhanced ecommerce plugin (ec.js), it will replace that plugin request with drop request i.e. it will drop the request to download the plugin. In other words, enhanced ecommerce plugin will not download going forward and you can now check how your website behaves without enhanced ecommerce tracking setup. Note: Whatever changes that you are making on the website via Fiddler will appear only to you on your browser. You can’t actually disabled enhanced ecommerce tracking of someone’s website without server access. Step-5: Delete the previous session list by selecting ‘Remove All’ from the drop down menu, Type the website address (whose enhanced ecommerce tracking you have disabled) in the ‘quick execute’ box and press enter. Note: A dropped session has a status code of 0. 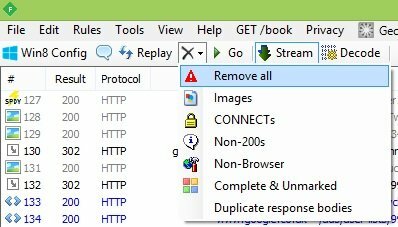 Step-1: Select the HTTP request you want to replace by another request from the session list. 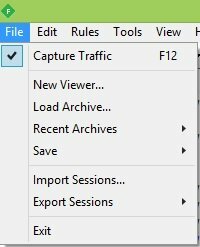 You need to select the request for the file which contains scroll tracking script. Step-2: Click on the ‘Auto Responder’ tab. Make sure that ‘Enable Automatic Responses’ checkbox is checked. Step-3: Click on the ‘Add Rule’ button. 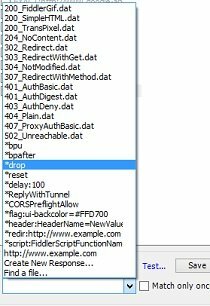 So what Fiddler will do now, that going forward, whenever it will see a HTTP request to download the file which contains the scroll tracking script, it will replace that request with the file which contains the new scroll tracking code. Note: Whatever changes that you are making on the website via Fiddler will appear only to you on your browser. You can’t actually modify tracking script of a website without server access. Step-6: Delete the previous session list by selecting ‘Remove All’ from the drop down menu, Type the website address (whose scroll tracking script you have modified) in the ‘quick execute’ box and press enter. You may need to identify all those web sessions in which a cookie is set by an HTTP response. You can do that by installing a Fiddler add on called ‘Privacy Scanner’.